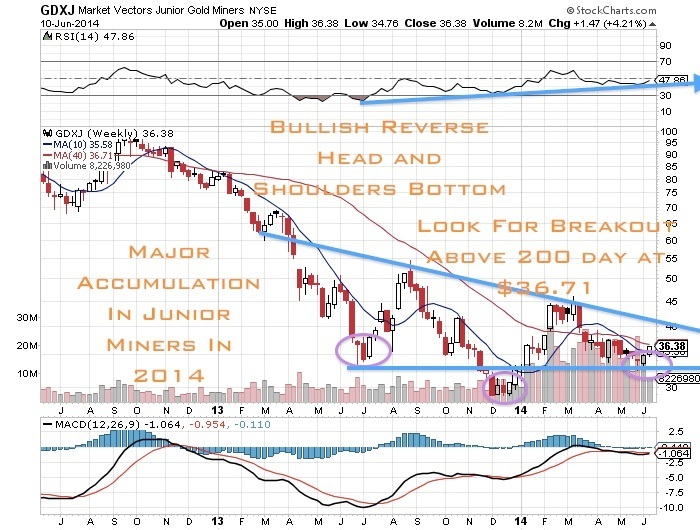 Get ready for an incredible bounce higher in the gold & silver junior miner sector. Here are five reasons why. The above are edited excerpts from an article* by Jeb Handwerger (goldstocktrades.com) entitled Why Capital May Be Flowing From Equities to Junior Miners in 2014. The following article is presented by Lorimer Wilson, editor of www.munKNEE.com (Your Key to Making Money! ), www.FinancialArticleSummariesToday.com (A site for sore eyes and inquisitive minds) and the FREE Market Intelligence Report newsletter (sample here; register here) and has been edited, abridged and/or reformatted (some sub-titles and bold/italics emphases) for the sake of clarity and brevity to ensure a fast and easy read. This paragraph must be included in any article re-posting to avoid copyright infringement. Some of my charts are showing a potential reversal in the precious metals over the next couple of weeks. The junior miner gold ETF, GDXJ, is reversing above the 50 day moving average and breaking above its recent three month downtrend. …The…cash positions waiting on the sidelines [and/or the]…profits taken…[from] the rising equity market… return to the ignored resource sector the gains could be huge. Already the 2014 volume in GDXJ has jumped considerably, outpacing 2012 and 2013. On the other hand the S&P500 has been rising on light volume which is often a warning sign that the extended rally is getting exhausted. [All of] this indicates to me that possibly the large institutions are accumulating the juniors after all the retail investors jumped ship. Get ready for an incredible bounce higher in precious metals. Increased M&A in the gold mining space and equity investments in junior miners should tell you where the smart money is headed. Take a look at the recent Osisko deal where Yamana outbid Goldcorp for their Quebec mine as a recent example and a straw in the wind. Look at Gold Resource Corp (GORO) and Hecla’s (HL) increased investments in the junior space. Gold and silver are trading way below their three year trailing averages which indicates that the price is way oversold and a major bounce is likely. Furthermore, gold is priced below production putting strain on future supply as miners mothball marginal projects. 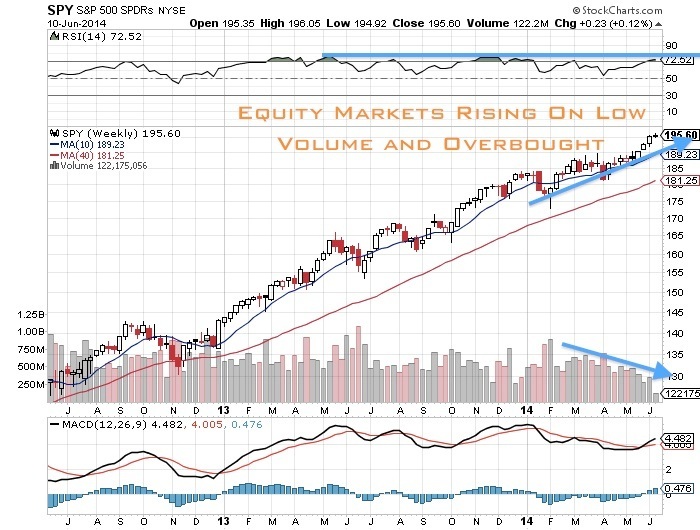 The equity markets are too high reaching extreme overbought and speculative levels similar to 2007 before the crash. A correction in equities sparked by fears of deflation could spark the return to gold and silver as a safe haven as Central Banks may continue to push negative interest rate policies similar to what the ECB recently announced. Gold and silver have been basing for three+ years and the junior miners have been in arguably a seven year bear market reaching historic oversold levels. Previous What Would Likely Occur If Oil Rose to $140+ In Today’s Hyper-leveraged Global Economy? Of the “reasons” listed, I think Geo-Political is the most important since such an event would further stress a very leveraged paper money )aka FLAT) system and probably result in a major shift in the value of the US$.